their infant son, Logan, back to Nakisenye, the shaman’s village, for a traditional naming ceremony that involved “four goats, seven chickens and a wad of U.S. cash,” Morrison recalled. 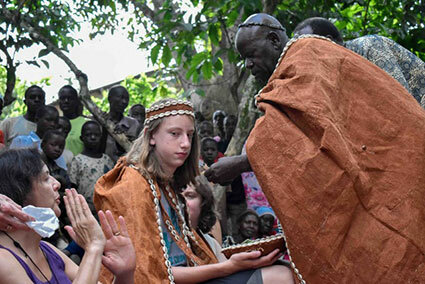 And this past July, they brought Logan, now 14, back to celebrate a second bar mitzvah with the Abayudaya Jewish community of Uganda (his first took place in September 2017 at the United Synagogue of Hoboken). 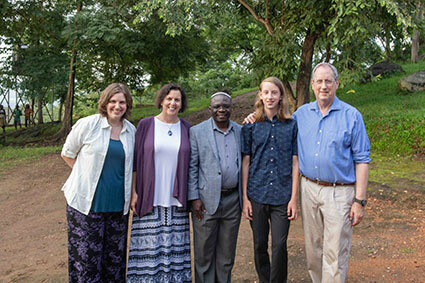 After what Logan acknowledges was “a bit of culture shock,” the family celebrated his milestone in the synagogue of Uganda’s 2,000-strong Jewish community near the town of Mbale, overseen by Uganda Chief Rabbi Gershom Sizomu. Logan also raised money for eight Chromebooks to set up a computer lab at the local school; every Sunday, he teaches students coding via Skype. Way to go. Hold a celebration of life in a country that kills people for who they are (LGBT). Shows how much class you have. Andy D – this family did nothing to support the government that is anti LGBTX. They support a family, a community and a heritage that is inclusive and aiming gor a better educated Uganda. I have a friend who documents the stories of post-war and genocide survivors in Uganda, South Sudan and Rwanda. She amplifies their voices snd showcases economic development efforts. By your ligic she shouldn’t do this life changing social justice work? You make no sense and do nothing for your cause.